Norwegian band Röyksopp released a music video for their single, “Happy Up There”, on February 24, 2009. Röyksopp members Torbjørn Brundtland & Svein Berge worked with Joyriders director Reuben Sutherland to imagine a world under threatened invasion from Space Invaders. Happy Up There starts with panning shots of a cityscape, with floating boxes lit up by light bulbs. We discover that the boxes are 3D versions of the digital monsters known to many from the 1980s arcade game Space Invaders. The video continues to play out the epic air battle, with cars on the ground serving as the defence. The video ends when the remaining aliens retreat. Happy Up There was directed by Reuben Sutherland via Joyrider Films with producer Spencer Friend. 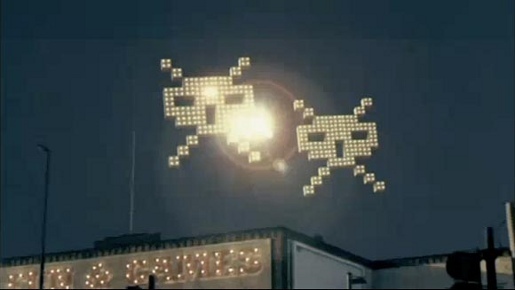 Space Invaders was created by Japanese designer Tomohiro Nishikado and released in 1978 by Taito.